Correlative species distribution models (SDMs) often involve some degree of projection into novel covariate space. Most methods for identifying this extrapolation focus on the range of each model covariate individually. However, extrapolation can occur that is well within the range of univariate variation but which exhibits novel combinations between covariates. 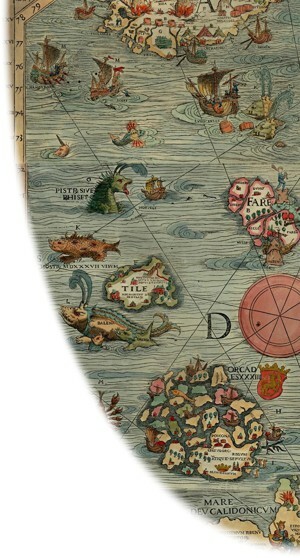 It is, therefore, important that we develop a better understanding of dragons potentially lurking in the uncharted waters of novel covariate space. The ExDet tool is a standalone GUI (Graphical User Interface) which has been written in MATLAB ®. You do not, however, have to have MATLAB® to be able to run ExDet. The ExDet tool has been deployed as a standalone executable package which can be installed and should function on any operating system platform. The ExDet tool can be freely downloaded and used for educational and research purposes, but not for commercial use. The software is provided ‘as-is’, and does not come with any warranty or guarantee of any kind. Use of the ExDet tool or applications of the concepts underpinning the tool, including derived products, must include appropriate citation to the original paper describing the tool (Mesgaran et al. 2014). By downloading the tool you agree to these terms. You need to be a registered user of the CliMond archive and must be logged in to download the ExDet tool. If you have not already registered, you can do it here. This process will only take a couple of minutes. Would you like a sneak preview of the ExDet tool? View the video tutorial here. I have used the ExDet tool in my research, how can I cite it? How do I know which version of the ExDet tool I am using? Version control is used for all CliMond archive data products. The current version of the ExDet tool is V1.1 and this was released on the 26th November 2014. The second to last component of the file name string contains the version number. Please view the ExDet changelog for details on updates applied to the tool. How do I install ExDet? If you are installing ExDet V1.1 for the first time, please follow the instructions in the readme file or in the video tutorial. If you have already previously installed ExDet V1.0 on your computer, you do not need to install any new versions of Matlab Compiler Runtime (MCR), supplied as part of the ExDet tool zip file. Simply copy and paste the executable file of ExDetV1.1 into your ExDet directory and run the program by double clicking on the ExDetV1.1.exe file. I’m a novice modeller, can you teach me how to use the ExDet tool? Please view our video tutorial hosted at YouTube here. You can download the sample data that is used in the tutorial here. The sample data contains 4 clipped Bioclim variable layers for Australia and South Africa sourced from the CliMond dataset. Is the ExDet tool easy to use? The ExDet tool has an easy to use graphical user interface and presents results from the analyses in both graphical and tabulated form. All outputs from the ExDet tool can be exported in standard formats for using elsewhere. Consider the ExDet tool as an essential companion to any other modelling software you choose to use. What covariate data formats can be imported by ExDet? The current version of ExDet works with gridded data. The tool can read ESRI grids (GIS environmental layers) in ascii or txt formats. Both CliMond and WorldClim provide climate data in ESRI grids formats which are compatible with the ExDet tool. What analysis data can be exported from the ExDet tool? The ExDet tool allows you to export the results of your analyses in standard image, tabular and ascii file formats. This greatly simplifies the inclusion of ExDet analyses into your existing modelling workflow. Do I need to know programming (in MATLAB) to be able to use ExDet? No, the ExDet tool is presented as a user friendly GUI. All you need to do is simply input your data by locating them on the computer running the ExDet tool. The requested outputs are then generated by simply clicking on the relevant buttons. What sort of data should be used as the reference set? The choice of data to compare depends on both the modelling approach being used as well as the question(s) being addressed by the research. For example, if you are using MaxEnt, the background data can be used as the reference set. Alternatively, actual presence records can be better reference data for envelope-based models. Please note, however, that the current version of the ExDet tool does not accept presence records as input if they are not formatted as raster grids (ascii or txt). Does the ExDet tool’s NT1 metric (univariate extrapolation) differ from the MESS tool of MaxEnt? The method for calculating Si and UD are the same; however, MESS reports the minimum Si as the degree of dissimilarity of a point, while ExDet’s NT1 is based on the summation of all Si/UD values. As shown above, MESS would report a common dissimilarity value for the two points because they both have an identical minimum Si of -3. However, it is clear that Point 2 is more dissimilar because it is beyond the range of all four covariates, while Point 1 is outlier with respect to only one covariate (i.e. Bio4). My question is not in the list above, can I contact you? Yes, please get in touch with us via the CliMond archive contact page if you have any questions or suggestions. I have a problem with the ExDet tool, what should I do? Please view the Common User Errors section below, for problems encountered by other users, or watch the video tutorial to learn how to install and use the tool. If you are still having problems, please contact us. Please avoid using long names for your covariate raster files. We recommend a maximum of 8 characters. In this hypothetical example, the size of Bio12 is 4×3 (4 rows × 3 columns), while that of Bio01 is 3 × 3 (i.e. Bio01 is missing one row). To calculate the covariance between these two layers, they need to be of the same size; to achieve this ExDetV1.1 trims Bio12 by removing the last row of the matrix (bottom row). If Bio12 had additional columns, they would be trimmed from the right (i.e. back to 3 columns) to match the smallest matrix size in data set. Both layers have the same dimensions (4×3) but Bio12 has a NaN in the lower right corner cell, whereas Bio01 has a valid value at the same coordinate (shown with yellow shading). Using the ExDet V1.0 tool, the extrapolation analysis would have stopped if given such a discrepancy. However, using the ExDet V1.1 tool the value “13” in Bio01 is treated as missing value (i.e. as a NaN) and the ExDet data analysis continues. To see if your chosen covariate layers have these discrepancies, see the summary provided by the new “Data Checker” button on the Input Data window. In conclusion, we recommend that you carefully check the size and the number of valid points in your data to maximise the insight generated by the ExDet tool. Even though ExDet V1.1 will perform extrapolation analyes with uneven or missing data, we caution that it is very important that you consider the implications of this situation for your data interpretation.